To understand a fighter like Kali Reis, you must first understand the person, Kali Reis. Born on Aug 24, 1986 in Providence, Rhode Island, Kali’s roots stem well into American history with her Native American heritage. The name “Mequinonoag”, which she carries into the ring with her for every fight, was bestowed on her as her Native American name. Kali explains that the name was, “given to me by my mother, she is the medicine woman of our Seaconke Wampanoag tribe. It means “May Feathers”, or “Many Talents.” Kali is a proud, mixed Native warrior women. Carrying the Native Warrior blood of the Cherokee, Nipmuc, and Seaconke Wampanoag tribes, the Providence-born fighter started boxing at the age of 14 out of Manfredo’s Gym in Pawtucket, Rhode Island. Prior to turning pro, Reis had a brief, but successful amateur career, securing a variety of achievements such as the 2007 Rocky Marciano Championship, the 2007 NYC Golden Gloves at 154 pounds, and the 2006 New England 154 Championship. Professionally, Kali has already attained three world titles. In 2014, she TKO’d Teresa Perozzi to win the International Boxing Association Female Middleweight Championship. 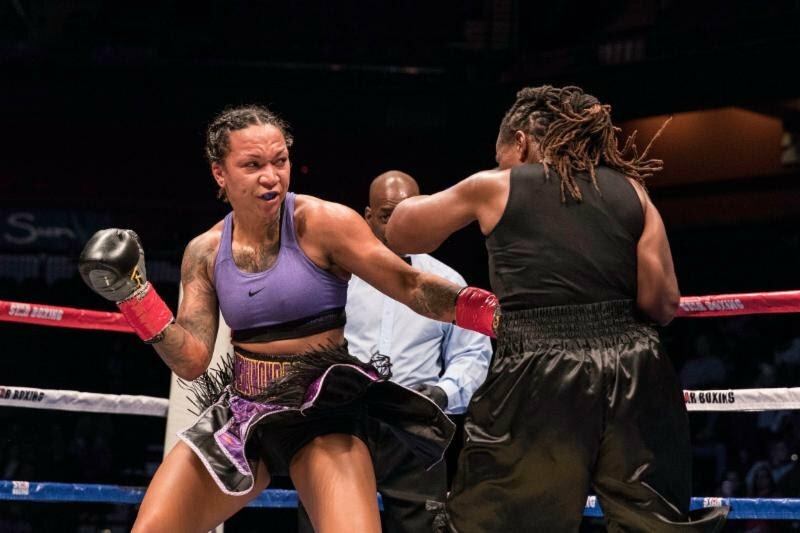 Two years later in 2016, Reis earned a vicious first-round TKO win over Victoria Cisneros for the Universal Boxing Federation World Female Middleweight title. In that same year, only two months later, the Rhode Island fighter went the full distance in a 10 round war with Maricela Cornejo, winning a clear unanimous decision victory to earn the WBC World Female Middleweight belt. One of her most impressive performances came against a tough Tiffany Woodward in November. Entering the ring to a traditional Native American display, the Providence Warrior went toe-to-toe with Woodward, creating constant uproars from the packed crowd resulting in her earning a six-round unanimous decision victory at Mohegan Sun Casino, and easily the fight of the night. Catching the eye of renowned New York boxing promoter, Joe DeGuardia, Reis was immediately signed to Star Boxing Inc..
On May 5th at the StubHub Center, Kali will enter the ring, just as she always does, in a traditional Native American display, literally carrying her Native American pride on her sleeve. However, with this entrance, history will be made. Kali aims to upset the apple cart, defeat Braekhus and secure the four most prestigious championships in the sport (IBF, WBO, WBA, WBC), which are all held by the women considered to be the best boxer in the world today, the undefeated, undisputed welterweight champion, Cecilia Braekhus. With a win, Kali will immediately establish herself as one of the greatest decorated female boxers of all time. Braekhus vs Reis is the co-feature bout to the main event of Golovkin vs Martirosyan airing on HBO, May 5th, live from the StubHub Center in Carson, California.